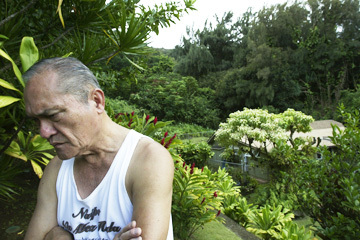 LeRoy Akamine is one of a number of residents in Nuuanu Valley who are against the development of 50 acres in Dowsett Highlands. In addition to concerns about floods, rockslides and traffic, residents believe the area might have historical significance; Akamine has said he has seen rock walls and wonders if there could a heiau. A modern-day battle for Nuuanu is taking place in neighborhood board meetings and the city Department of Planning and Permitting. At issue is a planned nine-lot subdivision in Dowsett Highlands on about 50 acres above existing homes between Ragsdale Place and Kamuela Place. Residents feel the development is unsafe because of the increased danger from flooding and falling rocks. In 2002 a boulder crashed into a home about a half-mile from the planned development, killing 26-year-old Dara Onishi. "A subdivision like this is built on a steep mountainside. What danger does it present to life, limb and property?" asked LeRoy Akamine, a resident of the area and a member of the Nuuanu Valley Association, an organization that has distributed about 300 signs protesting the development and collected more than 1,000 signatures on a petition against it. The group would like the state or the city to take a closer look at or even ban developments on steep hillsides. But the land is already zoned for residential development, so no public hearing is required for approval of permits to allow the development to proceed. If the subdivision permit is approved, the land can be sold as separate parcels. "Is there is any reason why the property shouldn't be entitled to development?" asked attorney Sam King Jr., who represents Patrick Shin, formerly of Nam Inc., who purchased the property. "If there is, I never heard of it," King said. The developer does have to submit a number of reports to the city to address issues like access, soil stability and drainage before the permit can be approved or denied. The developer asked for an extension until Oct. 21 to conduct an archeological survey of the entire project site, said Henry Eng, director of the city Department of Planning and Permitting. The city is also waiting for an updated drainage report to address water runoff. Even if the subdivision permit is approved, the developer would still have to apply for a grading permit before preparing the land for construction and a building permit before work can start on homes. In addition to flood control, rockslides and increased traffic, residents also believe the area might have historical significance. As a boy hiking in the area, Akamine said he has seen rock walls and wonders if there could be a heiau or agricultural complex there. "We are going through that process, and we remain hopeful that government will see the inappropriateness of this development," Akamine said. Shin is no longer the principal developer of the property, King said. But from what he has seen, King believes the city will approve the subdivision. King represents Shin in an unrelated criminal case involving federal construction projects. Nuuanu resident Tony Clapes says development on slopes is not unique to Nuuanu. He cites developments in Manoa and Aina Haina, where an unstable slope has caused land under homes to slide, forcing condemnation of the homes. "The city's ability and even the state's ability to deal with geological questions is minimal," Clapes said. "Any decision made on the basis of incomplete information creates a risk because you've done something without knowing what the consequences are going to be." But David Tanoue, deputy director of the Department of Planning and Permitting, said the city requires the developer to hire experts to address those concerns, and the experts must certify their findings.